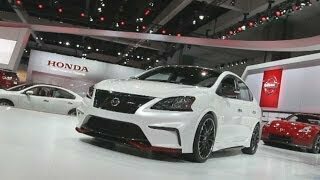 Nissan has unveiled the Nissan Sentra Nismo Concept, performance-tuned concept version of Nissan Sentra, at the 2013 Los Angeles Auto Show. The concept car offers an outstanding balance of premium style, innovative technology and fuel-efficient performance. Exterior modifications start with a deep front fascia with lower LED lights and wide lower grille that match the stock Sentra's standard LED daytime running rights and upper grille. The aerodynamic look continues with a wide lower front spoiler and large dual exhaust tips. A custom rear spoiler and center rear fog lamp complete the look. Wide 19-inch RAYS aluminum-alloy wheels with Michelin Super Sport performance tires and red-painted 370Z Brembo brake calipers complete the package. 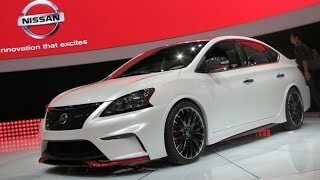 The 2013 Nissan Sentra Nismo Concept is powered by the 1.8-liter direct injection turbocharged engine producing more than 240 horsepower and 240 lb-ft of torque. The engine is matched with a beefy 6-speed manual transmission and limited-slip differential.